Is there a network diagram program using on Mac similar to Visio? 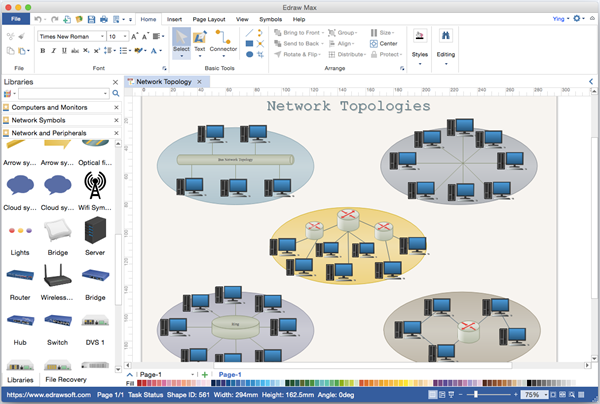 Edraw is a popular Visio alternative for making network diagram and other drawings on Mac system. It's easy to find network diagram Visio alternatives for Windows, but it's hard to find similar products for Mac. For Mac users, Edraw has developed a cross-platform version allowing users to make network diagram easily on OS X system. It's fast, easy and affordable. Edraw is a vector based network diagram maker containing similar features with Visio that helps easily design network diagram with ready-made symbols and templates. The network diagram symbols are comprehensive, accurate, and with the editable vector format. The software interface assembles Microsoft Word, thus very easy to understand. More importantly, it works well on both Windows and Mac OS X system. Drag-and-drop based interface to draw any kind of network diagram. Include a comprehensive collection of network diagram symbols, with vector format. Automatic alignment for neat, crisp drawings. Effective connection of shapes with snap and glue feature. Includes extensive built-in themes with various color schemes. Easy to alter the whole diagram's color, effect and font by simply changing the active theme. Support real-time preview. Capable in printing or sharing. Easy to save diagrams for PDF, Html, Word, Visio, PNG, JPG, PPT, EPS, and many other formats. Ready for more than 200 diagrams, more powerful than Visio. Advanced service with a much cheaper price. Easy for document storage and sharing through cloud. Unlike Visio who provides limited examples and templates, Edraw gives you more choices. A great number of elaborately-designed network diagram templates are packed in the software. Besides, from the template sharing community on the official website, you will get a continuous update of new templates. Our stunning collection of editable templates will save you lots of precious time. You can easily handle basic network diagrams, Cisco network, rack diagram, AWS diagram, 3D network diagram, active directory, location network diagram, and so on. Use this Visio alternative for more drawings, such as flowchart, mind map, floor plan, project chart, Uml diagram, infographics, electrical schematics, science illustration, etc.